Upstate Vegas Events: Our Dealers teach you how to play casino games: Blackjack. 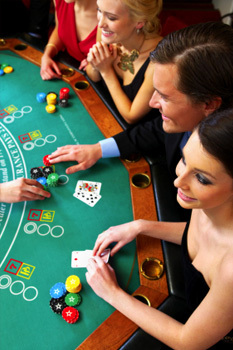 The aim of Blackjack is to accumulate a higher point total than the dealer, but without going over 21. You compute your score by adding the values of your individual cards. The cards 2 through 10 have their face value, J, Q, and K are worth 10 points each. The Ace is worth either 1 or 11 points (player’s choice). At the start of a blackjack game, the players and the dealer receive two cards each. The players’ cards normally are face up, while the dealer has one face down (called the hole card) and one face up. The best possible blackjack hand is an opening deal of an ace with any ten-point card. This is called a “blackjack”, or a natural 21, and the player holding this automatically wins unless the dealer also has a blackjack. If a player and the dealer each have a blackjack, the result is a push for that player. If the dealer has a blackjack, all players not holding a blackjack lose. After dealing the cards, the game goes on with each player taking action in clockwise order starting to dealer’s left. The player can keep his hand as it is (stand) or take more cards from the deck (hit), one at a time, until either the player judges that the hand is strong enough to go up against the dealer’s hand and stands, or until it goes over 21, in which case the player immediately loses (busts). In most places, players can take as many cards as they like, as long as they don’t bust. After all players act, either decide to stand or bust, the dealer turns over his hidden hole card. If the dealer has a natural 21 (blackjack) with his two cards, he won’t take any more cards. All players lose, except players who also have a blackjack, in which case it is a push, where the bet returns to the player. If the dealer doesn’t have a natural, he hits (takes more cards) or stands depending on the value of the hand. Contrary to the player, though, the rules dictate the dealer’s action. The dealer must hit if the value of the hand is lower than 17, otherwise the dealer will stand. If the dealer goes bust, all players who are left in the game win. Otherwise, players with higher point totals than the dealer win, while players with lower totals than the dealer lose. When the dealer’s face-up card is an ace, each player gets the chance to bet on whether the dealer has a blackjack or not. This happens before any other player actions. The insurance wager equals half your original bet and its purpose is to cancel out the likely loss of this bet. A winning insurance bet will pay at odds of 2:1, and since you lose your original bet, you’ll break even on the hand. Strategy guides tend to advise against taking insurance. When you get two starting cards of the same face value, you have the option to split the hand in two. You place another bet of the same size as the original bet and play on with two hands. (Note that it is legal to split 10-point cards, even if they do not form a pair. For example, you could split a jack and a king.) When you’ve decided to split a hand, the dealer immediately deals a second card to each hand. Now, if you’re dealt yet another pair, some casinos allow you to split the hand again, while others don’t. When you’re done splitting, each of your hands will be treated separately, meaning that you will take cards to your first hand until you stand or bust, and then carry on with the next hand. If you split aces, you are dealt a second card to each hand as usual, but you are not allowed to take any further cards (unless you are dealt another ace and split again). All hands resulting from splitting aces remain as two-card hands. If the second card dealt to a split ace is a 10-point card you do not receive the blackjack bonus for this hand. If the dealer also has a blackjack the result for this hand is a push as usual. In many places the same rule (no blackjack bonus) is played if an ace is dealt as the second card to a 10-point card after splitting. If you’re fairly sure that your hand will beat the dealer’s, you can double your original bet. You’re sometimes allowed to double down for any amount up to the original bet amount. In most casinos you may double down on any hand, but some casinos require an opening hand worth 11, 10 or 9. When you’ve chosen to double down, you’ll only get one more card from the dealer.